A Natural Swimming Pool is swimming pool that has clear water without using chemicals. These pools rely entirely on the plants and animals to condition the water. This is so effective that this pool has been tested and shown to be of drinking water quality. Also, through the continual natural "cleaning process" the pool water never needs changing, saving water. Chemical free so it is healthy for people and wildlife. Wild Swimming at home. 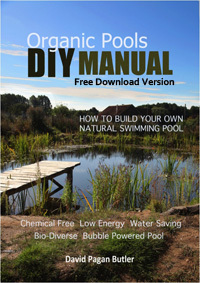 Preview of DVD "Natural Swimming Pools- A Guide to Designing and Building Your Own." Natural Swimming Pools for the BBC. It is a useful introduction to the benefits of swimming in natural water and gives some beautiful examples of some commercially installed pools. Me digging the larger pool. Pool skimmer from a piece of drainage pipe, a bucket and a child's crabbing net.